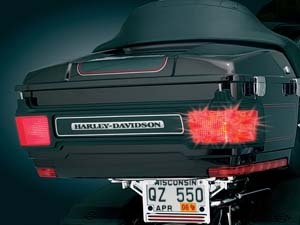 CD-LR1: This quick addition to the Air Wing Tour Pak® Luggage Rack adds an additional running and brake light that demands attention! One row of 24 super bright 5mm LEDs are sealed behind a red or smoked lens. 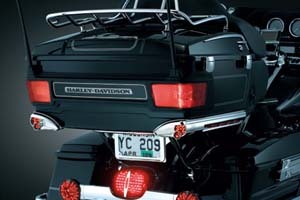 The unit is installed with provided mounting hardware to the underside of the Air Wing Tour Pak® Luggage Rack placing this light bar right at eye level to the traffic behind you. Lifetime OEM LED Warranty. 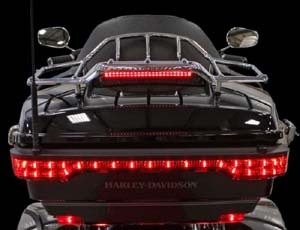 Plug and play installation on 2014 to current Harley-Davidson® Touring and Tri GlideTM models equipped with Air Wing Tour-Pak® Luggage Rack. Also fits 2014 to current FLHTKSE and 2015 to current FLTRUSE models with Original Equipment Tour-Pak® Rack. 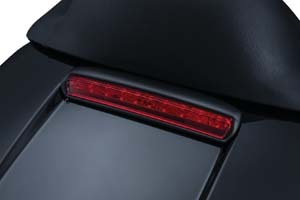 Check out our MS-PS for Flashing and Strobe patterns for the above product. CD-LR2: Similar to above but for model year 1996 - 2013. 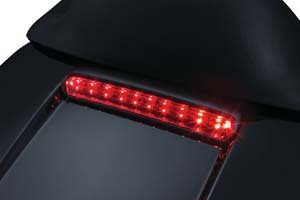 TL-06: Additional rear lighting is always a good thing, and our Tour-Pak Lid Light delivers a triple dose of run-turn-brake functionality to significantly enhance rider visibility for trailing motorists. Fits inconspicuously in the recessed space on top of the lid and features high-intensity L.E.D. 's for ultra-bright performance. 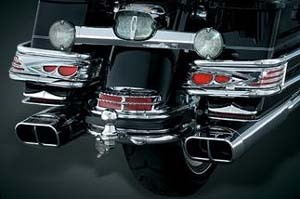 Fits: Harley '14-current FLHTCU Electra Glide Ultra Classic, FLHTCUL Electra Glide Ultra Classic Low, FLHTK Ultra Limited, FLHTKU Ultra Limited Low, FLHTKSE CVO Limited, FLTRU, FLTRUSE & FLHTCUTG Tri Glide Ultra. TL-07: Similar to above but in Satin Black. 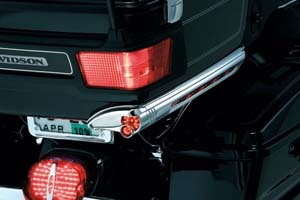 CTB-1C: The cleanest way to add more light to the back of your bike. 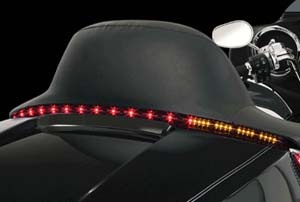 The low profile light strip fits between your backrest and tour pack to blend right into the motorcycle, while at the same time adding bright sequential turn signals, running lights, and center brake light. GE-II: Features incredibly bright LEDs. Lifetime OEM warranty against LED failure. 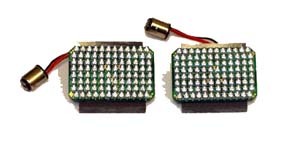 96 LEDs per board for unmatched performance. Plug and Play (No Load Equalizer or Converter Needed). 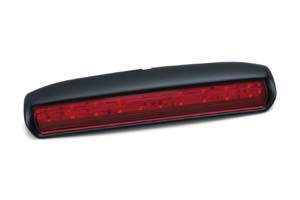 Red dual intensity LEDs work with red, smoked, or clear lens. Fits all Ultra Style Tour Pak® except '14 and newer. 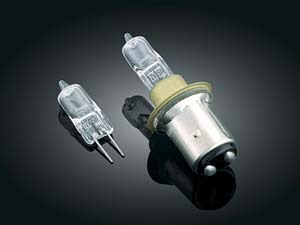 TP-19/25: This self-modulating bulb warns drivers behind you of your deceleration. Apply the brakes and the bulb pulses rapidly and then remains brightly illuminated as long as the brakes are applied. 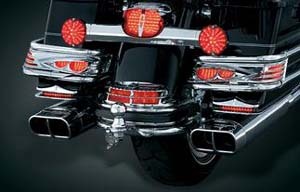 Sold as a pair or individually to cover most 1157 taillight applications. 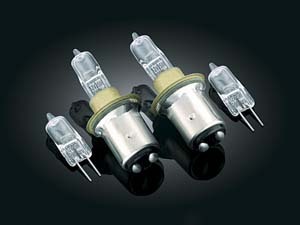 Includes spare G4 2-pin Halogen bulb. 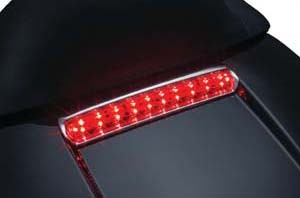 Fits: Replaces 1157 bulbs in run-brake taillight applications. LLT-650: Break free from the ordinary! We've combined a graceful 3-D shape & new lens technology to breathe life into the Tour-Pak. 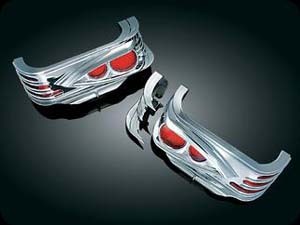 These chrome accents install right over the stock red lenses or chrome accents providing sleek styling & additional back lighting. Rear facing lenses are lit with red L.E.D. 's which may be wired for auxiliary run/brake, or run/turn function. Lenses on the sides feature a new finish which appears as chrome but will allow the red lighs in an Ultra Tour-Pak to shine through. 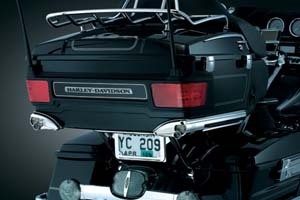 7766: Classic American styling for your modern American touring bike. 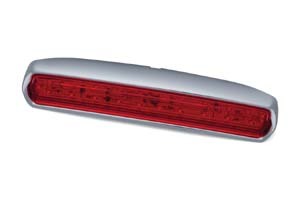 Features include ultra bright rear & side facing dual function L.E.D. 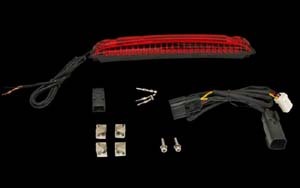 lighting & plug & play wiring that makes installation straight forward & painless with minimal disassembly. 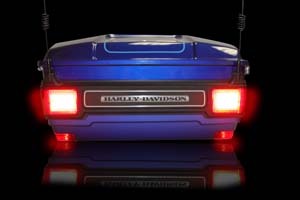 The rear & side facing lights are both two-function & can be wired to operate independently of each other.